Not being able to play at Rivermead was a huge disappointment to the players and management of Rockets so the John Madejski Academy sports hall hosted this crucial semi- final. With captain Danny Carter getting out of a sick bed to shirt up, Ronan O’Sullivan still out with a long term hand injury, Adrian O’Sullivan needing at least another week before returning to training with an ankle injury and then Sam Grant wearing a surgical boot from an injury picked up yesterday, Head Coach Alan Keane knew he’d be heavily dependent on his two Americans, one other senior, new signing Tanner Kuehn ( who arrived at Rockets Thursday evening ) and the Academy young men. As courageous as Rockets were, even leading by 7 points early in the second period, a barrage of four trebles and a stronger in depth team saw Riders lead by 7 at the interval, a lead they were never going to relinquish for the remainder of the game. The opening quarter with Rockets 18-13 became 35-42 by the break with the game having been tied 3 times and with both teams being restricted by the other to scoring runs that didn’t exceed 7 whilst Rockets biggest lead was 7 pts., and Riders just 8 pts., such was the competition to secure a place in the National Trophy final . Riders were coming off victory in the National Cup Final last Sunday when they beat the league’s top side Solent Kestrels by 19 pts so were oozing with confidence despite being on the wrong end of a league loss at Rockets hands just 5 weeks ago in Reading. The third quarter was the defining period for Riders as they extended their advantage to 13 pts at 63=50 with 3 more trebles and only Trae Pemberton and A J Carr scoring for Rockets. The final stanza opened with A J just not having the rub of the ring, Riders scoring and Carter being called for his fourth foul. Within 3 minutes of the restart both Rockets big men A J Carr and Danny Carter were excluded as having received 5 personal fouls each and now the game was probably truly against Rockets . Nonetheless Pemberton continued to encourage the Academy guys and Sydney Donaldson hit 4 from 4 from the free throw line. Tanner Kuehn had hit a treble as his first Rockets points and hit a jumper but three consecutive trebles from Riders saw them a safe distance ahead as Rockets depleted team just couldn’t reduce the deficit and the game ended 91-66 in Riders favour. Both Rockets Americans had again been outstanding as A J Carr hit 23 pts., 7 rebounds and 4 assists and Trae Pemberton 15 pts., 6 rebounds, 2 assists and 3 steals. Rockets other leading scorers were Danny Carter with 7 pts as did Sydney Donaldson. Regrettably with only balcony standing space at the JMA sports hall, tickets are limited. Please contact the Basketball Hotline ( 0118 926 3040 ) or email: tickets@readingrockets.co.uk to book your ticket. Rockets topped their National Trophy pool after securing wins over Thames Valley Cavaliers and Hemel Storm whilst the Riders were victorious over Leicester Warriors and Nottingham Wildcats to reach the last four. 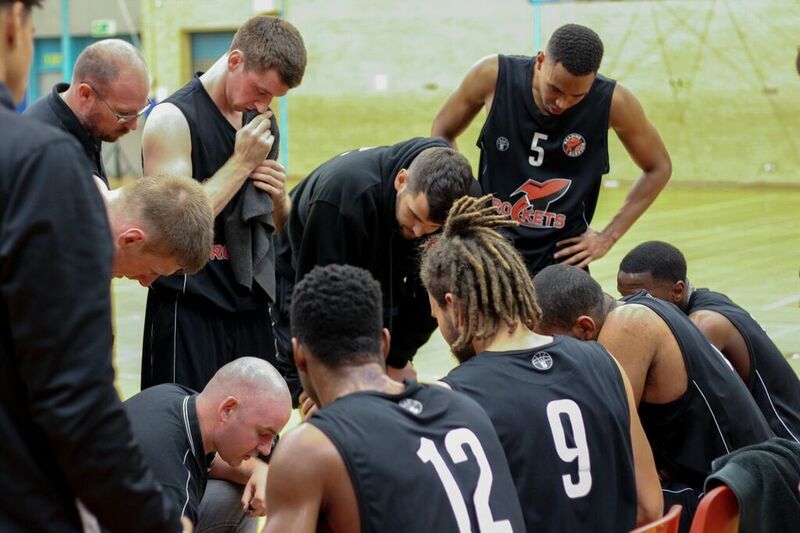 The East Midlands outfit will be buoyed by their National Cup triumph last weekend as they beat current NBL Division One league leaders Team Solent Kestrels by 82 points to 63. “Loughborough really showed their true class during Sunday’s final so they will be a tough opponent for us this weekend. I had a good chance to look at them so I am hoping with great preparation as well as committing to everything we have been doing, we can be ready to compete with them for forty minutes. Rockets will be looking to reach their seventh National Trophy final in their 21 year history for a chance to win a record sixth title in the prestigious competition. On the injury front, the Reading outfit go into the game with some better injury news. Irishman Ronan O’Sullivan who has been out of action with a long term wrist injury looks set to return and will provide Coach Keane with some much needed depth. Captain Danny Carter has benefited from a week off and should return to the line-up but will continue to nurse a long standing back issue. With Rockets Under 18s in action the day before, the Berkshire outfit should have a fully fit team as they pursue their first final since the 2015-2016 season.